There is an ACDelco Wiper Product for most makes and models on the road. Once you experience the quality, effectiveness and ease of installation, ACDelco will become your brand of choice for automotive wiper products. Advanced rubber technology providing longer life cycle. Hi tech design reduces wind lift at high speed. Even pressure on windscreen when compared to conventional wiper assemblies. 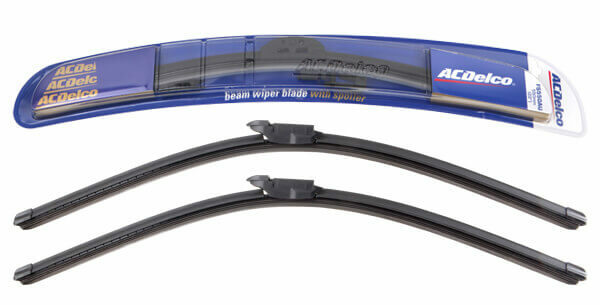 ACDelco Beam Blades can be used to update most vehicles fitted with traditional wiper assemblies. Assemblies are tested for 480 hours in a heated salt water spray chamber for durability and corrosion. Multi fit – easy installation. Better performance than conventional blades in cold zones. Slim line design to suit modern vehicles. Exposed components are subjected to an ozone resistance test and snow block test to ensure beam blades are suitable for the extremes of Australia’s harsh conditions. A reduction in the number of moving components.